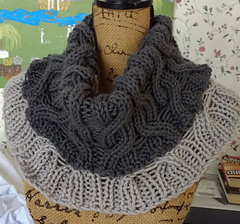 For the folded over extra thick version - pictured here - use 2 skeins of a bulky yarn - approx. 272 yds total. 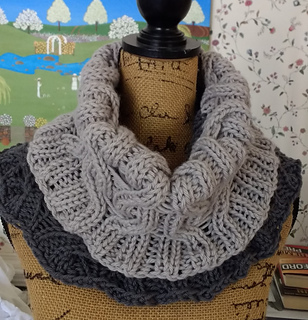 This cowl is completely reversible, and when worked in two colors it gives you two different looks to complement your changing wardrobe! 1 or 2 skeins 136 yds each bulky weight yarn. The final pattern in the Xmas in July KAL being hosted on the Criminal Knits…for the Serial Knitter in all of us. Group - come join us!